India and the United States signed the Communications Compatibility and Security Agreement (COMCASA) during the 2+2 strategic and defence talks between the two countries, hosted in New Delhi. The agreement allows India to obtain highly encrypted military technology and hardware from the US. The US was keen on pushing this agreement though India had reservations that COMCASA would infringe upon India's sovereignty and give the US access to India's military establishments. The talks were held between India's External Affairs Minister Sushma Swaraj and Defence Minister Nirmala Sitharaman and their US counterparts, Secretary of State Mike Pompeo and Defence Secretary Jim Mattis. This is the first overseas engagement Mattis and Pompeo have had in their official capacities. 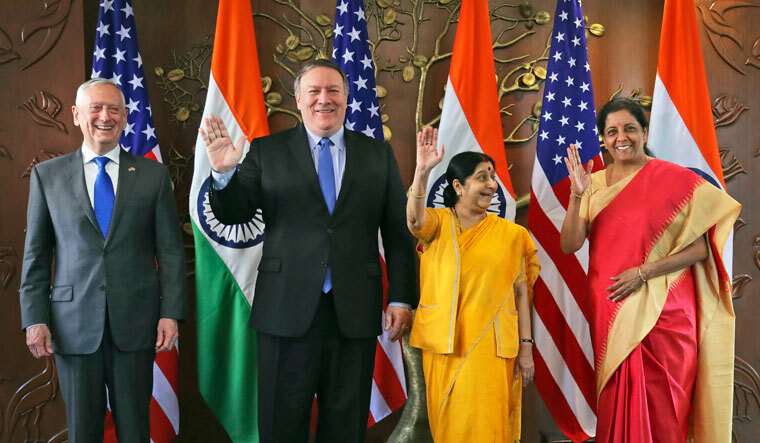 The 2+2 talks, which India had called one of its major diplomatic events of the year, ended on a high note for the US, with the COMCASA firmly in its pocket. COMCASA was the next step for the US after the inking of the Logistics Exchange Memorandum of Agreement (LEMOA) allowing the two countries to use each other's bases for logistical replenishment. For the US, these two agreements, as well as the Basic Exchange and Cooperation Agreement for Geo Spatial Coperation (BECA), are essential for functional military ties. Talks on BECA should follow next. The two nations also agreed to hold a tri-services military exercise off the east coast of India next year. The two countries will also work on strengthening defence innovation with exchange programmes. In the joint statement, the four participants repeatedly spoke of their convergent views on the Indo-Pacific which included the objectives of open and free navigation and a rules-based approach. Swaraj flagged the issue of H1-B visas. Ever since President Donald Trump's inauguration there has been uncertainty about the visa quotas for Indians. Swaraj said that India expected a non-discriminatory, predictable approach to the H1-B visa regime given its high impact on innovation, competitiveness and people to people partnership. She told Pompeo that, following the friendship between Prime Minister Narendra Modi and Trump, Indians believed that the US would not act against the interests of India, and asked him to maintain this trust. Swaraj said she was very satisfied with the talks, while Sitharaman referred to them as productive, positive and purposeful. Mattis noted that the COMCASA was a landmark agreement which would deepen military-to-military cooperation. He also praised India as being a stabilising force in the Indo-Pacific region. The two countries agreed to step up counter terror cooperation and Mattis said it would be ten years since the 26/11 attacks. “We remember the lives lost,” he said. Pompeo reminded everyone that September 6 was significant as it was the tenth anniversary of the waiver that the Nuclear Suppliers Group had agreed to grant India for accessing nuclear material for peaceful use. He said the US was instrumental in obtaining the waiver, and he hoped that in the decade ahead, the US would continue to work with India. He said, hopefully the US-based firm Westinghouse would set up operations in India to produce clean fuel. He also expressed hope that the strengthening friendship would unlock the unparallelled potential of the private sector for energy and environmental needs.